Publisher: The Adventurers Club. No date, research reveals date to be 1955. Condition: Hardcover, dust jacket. Slight tear and wear to dust jacket, minor foxing to edges and end papers. Text clean, binding tight. With 23 photographs. 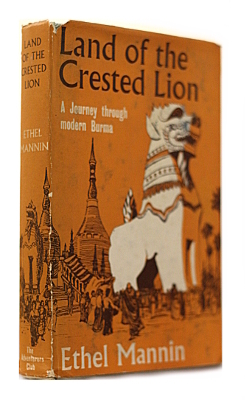 Burma in 1954 was still in some districts harassed by insurgents, but Miss Mannin, as the guest of the Buddha Sasana Council, a Government organization, was afforded facilities for travelling the country, from the deep south, on the borders of Siam, to the far north, five miles as the crow flies from Red China. She was given armed escorts where necessary, and everywhere stayed with the people of the country. She attended Buddhist weddings, visited Meditation centres, travelled by bullock-cart across the paddy-fields to off-the-road villages, went the pagoda festivals which began at sundown and continued till sunrise, travelled down the Irrawaddy from Mandalay to Pagan, where thousands of pagodas crumble in the burning dust of a thousand years, spent three nights as the only guest in a haunted rest-house, walked in the moonlight in a shuttered village unaware of the curfew…and recounts it all with characteristic vividness and sympathy. Ethel Edith Mannin (6 October 1900 – 5 December 1984) was a popular British novelist and travel writer. She was born in London into a family with an Irish background. Her writing career began in copy-writing and journalism. She became a prolific author, and also politically and socially concerned. Mannin’s memoir of the 1920s, Confessions and Impressions sold widely and was one of the first Penguin paperbacks. She married twice: in 1919, a short-lived relationship from which she gained one daughter, and in 1938 to Reginald Reynolds, a Quaker and go-between in India between Mahatma Gandhi and the British authorities. In 1934-5 she was in an intense but problematic intellectual, emotional and physical relationship with W. B. Yeats, who was on the rebound from Margot Ruddock and about to fall for Dorothy Wellesley (a detailed account is in R. F. Foster’s life of Yeats, concluding mainly that her emotional engagement was much less than his). She also had a well-publicised affair with Bertrand Russell.